A garbage disposal attaches directly under the sink drain between the drain and the rest of the standard plumbing. A leak that occurs only when the garbage disposal is running indicates a problem with the garbage disposal alone, and not the rest of the plumbing. A leaky garbage disposal that does not have a cracked housing is easily fixed. The repair often requires less than 5 minutes to complete. Turn on the kitchen faucet and switch on the garbage disposal. Look under the sink and locate the leak. If water is coming through the garbage disposal housing, the disposal must be replaced. 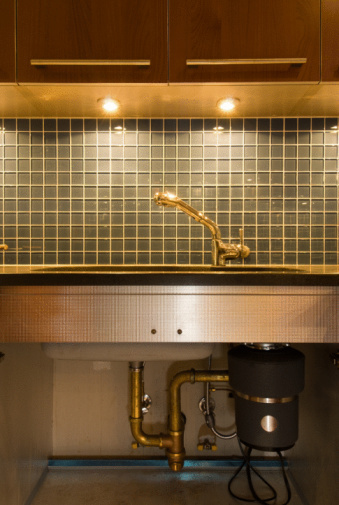 If the leak only occurs when the disposal is running, you will see water leaking from the top of the disposal, where it attaches to the sink drain, or at the bottom of the disposal, where it attaches to the drain pipe. Grasp the garbage disposal securely with both hands if the leak is occurring from the top where it attaches to the drain. Twist the disposal clockwise to tighten its connection to its mounting bracket. 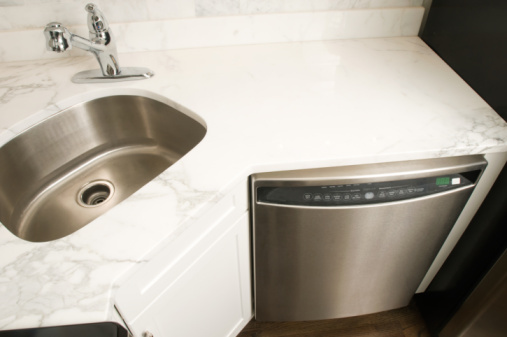 Sometimes the disposal can be loosened if it is bumped when items under the sink are moved. Tighten the mounting ring by turning the nut clockwise with an adjustable wrench. Use a screwdriver to tighten the metal band that secures the bottom of the disposal to the drain pipe, if the leak is occurring there. Turn the screw clockwise to tighten it after ensuring the drain pipe is pushed up as far as it will go. This connection also can loosen over time if it is bumped when items under the sink are moved.